Vincent Frank "Vinny" Testaverde Sr. (/tɛstəˈvɜːrdi/; born November 13, 1963) is a former American football quarterback who played for 21 seasons in the National Football League (NFL). He played college football at Miami, where he was an All-American and won the Heisman Trophy in 1986. Testaverde accepted an athletic scholarship to attend the University of Miami, where he played for the Miami Hurricanes football team from 1983 to 1986. As a senior in 1986, he was a consensus first-team All-American and won the Heisman Trophy, on his way to becoming the Hurricanes' all-time leader in career touchdown passes with 48. He played in the 1987 Fiesta Bowl against Penn State for the 1986 national championship, a game in which the Miami Hurricanes were heavily favored, but went on to lose 14–10 after Testaverde threw five interceptions. Testaverde played an important part in the University of Miami's history as one of the top collegiate football programs of the 1980s and 1990s. Along with Jim Kelly, Mark Richt, Bernie Kosar, Steve Walsh, Gino Torretta, Craig Erickson, and Ken Dorsey, Testaverde is considered part of the University of Miami's quarterback dynasty. He was inducted into the University of Miami Sports Hall of Fame in 1998. On May 7, 2013, Testaverde was also inducted into the College Football Hall of Fame. Testaverde was originally drafted with the first overall pick in 1987, and played for the first seven years of his career with the Tampa Bay Buccaneers. After being allowed to leave as a free agent, he spent most of the remainder of his career as a journeyman quarterback spending varying amounts of time with six other teams, the longest period being six years with the New York Jets from 1998 to 2003. He retired at the end of the 2007 season, after a career that spanned an impressive 21 seasons. Testaverde has thrown for more yards and more touchdowns in the NFL than any other eligible quarterback who is not in the Hall of Fame. Despite his long career and overall statistical achievements, Testaverde only had moderate success in terms of wins and losses. During the regular season as a starter he led his teams to 90 wins and 123 losses (with one tie). He has led his team to the postseason on three occasions, with an overall postseason record of 2-3. Testaverde was the first overall draft pick of the Tampa Bay Buccaneers in the 1987 NFL Draft. In his second season, Testaverde struggled heavily, with a 47.6% completion rate for 3,240 yards, 13 touchdowns, and 35 interceptions. During his tenure in Tampa, Testaverde received taunts from fans and radio personalities about his color blindness. In 1988, a radio station in Tampa rented a billboard that had Testaverde standing in front of a blue background. The billboard read: "Vinny thinks this is orange!" The high number of errors caused his intelligence to be called into question. National Football League Players Association president Gene Upshaw, unaware that his comments could be heard by anyone viewing through a direct satellite uplink, once commented during an NFL Live! commercial break that Testaverde was so dumb that he would drag the electric cord through his swimming pool while trimming the hedges, and claimed himself to be a better quarterback (Upshaw was a retired offensive guard) than Testaverde. His numbers continued to improve, and in the 1992 season, his last with Tampa Bay, he threw for a 57.5% completion rate for 2,554 yards, 14 touchdowns, and 16 interceptions. Testaverde signed as an unrestricted free agent with the Cleveland Browns in 1993. After spending half a season as a backup to his former Hurricanes teammate Bernie Kosar, he became the starter after Kosar's release by then Browns head coach Bill Belichick. Testaverde spent three seasons in Cleveland, and in 1994 led the team into the playoffs where they won the AFC wildcard game against New England before being defeated by Pittsburgh. After 1995, he moved with most of the Browns roster, coaches and staff to Baltimore and played two seasons with the newly formed Baltimore Ravens. 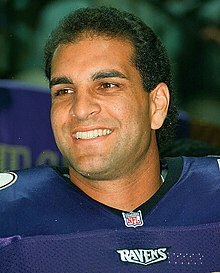 Testaverde made his first Pro Bowl appearance in 1996 with the Ravens. Said football statistics site Football Outsiders of Testaverde's unlikely 1996 season, "The real reason the Ravens ranked first in rushing [efficiency] was, believe it or not, Vinny Testaverde, who was out of his gourd as a scrambler that season. Ignore the official stats and take out the kneels, and Testaverde had 197 yards on just 23 carries, 8.6 yards per carry. He scrambled seven times on third down with 5-10 yards to go and converted six of those. He scrambled six times on a 1st-and-10 and gained a new first down five times. Testaverde had not rushed for 100 yards since 1992." In 1998, his first season with his hometown New York Jets, Testaverde flourished, completing 61.5% of his passes with 29 touchdowns, seven interceptions, and a 101.6 quarterback rating, making the Pro Bowl for the second time. In a December game against the Seattle Seahawks, Testaverde was involved in a play that was cited as an impetus for the NFL's adoption of a new instant replay review system the next season. With the Jets trailing 31-26 and twenty seconds left in the game, Testaverde attempted to score on a quarterback sneak on fourth and goal from the Seattle five-yard line. Testaverde had been tackled and the ball was not across the goal line when this happened, but because Testaverde's helmet had crossed the line the game's head linesman, Earnie Frantz, ruled the play a touchdown. The Jets won the game 32-31 and the loss was said to have cost the Seahawks a playoff berth and coach Dennis Erickson his job. The game's referee, Phil Luckett, drew criticism for the call although he was not the one who made it. In spite of the controversy, Testaverde's 1998 season was arguably his best season in the NFL. With him under center the Jets won the AFC East for the first time since the merger and earned a first-round bye and a home playoff game. In the AFC Championship Game that year, they lost to the eventual Super Bowl champion Denver Broncos. The Jets had Super Bowl aspirations entering the 1999 season. However, in the first game of that campaign against the New England Patriots Testaverde suffered a ruptured Achilles tendon and did not play the rest of the season. In 2000, however, Testaverde returned to quarterback the Jets. The highlight of the season was the "Monday Night Miracle" game against the Miami Dolphins on October 23, 2000, selected by fans as the greatest game in Monday Night Football history. In that game, the Jets fell behind 30-7 going into the fourth quarter, but came back to win the game, 40-37 behind five touchdown passes from Testaverde, including one each to Laveranues Coles, Jermaine Wiggins, Jumbo Elliott, and two to Wayne Chrebet. In 2001, Testaverde led the Jets back to the playoffs, where they lost in the first round to the Oakland Raiders. In 2002, he was replaced after a 1-3 start by Chad Pennington. He made cameo appearances to take the last snap in both the playoff clinching game versus the Green Bay Packers and the 41-0 playoff win against the Indianapolis Colts. In 2003, he was assigned to a backup role behind Pennington, although he started the first six games due to Pennington's left wrist injury. Despite his injuries, Testaverde's performance with the Jets endeared him to head coach Bill Parcells, who retired from coaching in 1999. One year after Parcells was lured out of retirement by Dallas Cowboys owner Jerry Jones, he brought Testaverde to the Cowboys in 2004. Testaverde initially was signed to be a backup and mentor to young Cowboys quarterback Quincy Carter, but after Carter was abruptly cut by the Cowboys for allegedly failing a drug test, Testaverde was given the starting quarterback job. While many questioned his ability to still play in the NFL, the protection schemes and play calling allowed him to showcase his arm, although with mixed results. He was able to throw for significant yardage, but led the league in interceptions, getting picked off on 4% of his passes. Dallas finished the 2004 season 6-10, tied for third and last place in the NFC East division. Testaverde's one-year contract with the Cowboys expired early in 2005. The Cowboys chose to instead sign Parcells's 1993 number one draft pick, Drew Bledsoe, as their top quarterback, leaving Testaverde without a contract. Parcells cites Testaverde's presence in Dallas as having been important to the development of their former starter Tony Romo. At the time, his 3,532 passing yards and 297 completions were the third best total of his career and the third most passing yards in Dallas Cowboys franchise history. He also tied the franchise record for 300-yard passing games in a season with three and became the fifth quarterback in league history to pass for over 300 yards at forty years of age. As injuries on September 25, 2005 knocked both Chad Pennington and backup Jay Fiedler out for the 2005 season, the New York Jets re-signed Testaverde on September 27, 2005. Testaverde was named the Jets' starting quarterback in week five of the 2005 season, in a home game against the team that originally drafted him, the Tampa Bay Buccaneers. On December 26, against the New England Patriots on the final ABC telecast of Monday Night Football, Testaverde set a new NFL record for most consecutive seasons with at least one touchdown pass, 19, by throwing a 27-yard pass to Laveranues Coles to secure the record. That pass is also notable as being the last touchdown pass thrown on Monday Night Football while it was still broadcast by ABC. The game was also notable because the Patriots sent in back-up quarterback Doug Flutie, making this the first game in NFL history in which two quarterbacks over the age of 40 completed a pass (Testaverde was 42, Flutie was 43). On November 14, 2006, the New England Patriots signed Testaverde as a backup to starter Tom Brady (the only other quarterback on New England's roster at the time was Matt Cassel). Testaverde kneeled down for the final play in a victory against the Packers on November 19, 2006. Testaverde threw a touchdown pass to Troy Brown on December 31, 2006 against the Tennessee Titans, giving him at least one touchdown pass for the twentieth straight season, extending his NFL record. The Patriots defeated the Jets, Testaverde's former team, in the first round of the playoffs, and Testaverde took the last couple of snaps to run out the clock. Testaverde wore #14 with the Patriots, the second time the number has been re-issued since Steve Grogan's retirement as P.K. Sam wore it earlier in the decade. On May 29, 2007, Testaverde stated his interest in returning to the Patriots for the 2007 NFL season, and on July 13, 2007 confirmed this with Sporting News Radio. He officially signed a 1-year contract for $825,000 on August 18, 2007, but was released on September 1, 2007. With Jake Delhomme out for the 2007 season due to an elbow injury he suffered in a Week 3 victory over the Atlanta Falcons, and David Carr out with a sore back, the Panthers signed Testaverde on October 10, 2007. Testaverde, wearing #16, started his first game with the team on October 14, 2007 against the Arizona Cardinals. In that game he threw a 65-yard touchdown pass to Steve Smith, extending his NFL record to 21 consecutive seasons with a touchdown pass. After leading the Panthers to a 25-10 victory, the 43-year-old became the oldest starting quarterback to win a game in NFL history, and the third-oldest to start one. He has also thrown touchdown passes to 71 different players, a record shared with Tom Brady. On Sunday October 28, coach John Fox named Testaverde the starting quarterback against the Indianapolis Colts. In that game, Testaverde led the Panthers in the longest opening drive for a touchdown in franchise history, consisting of 18 plays and lasting for 11 minutes and one second. Despite winning time of possession in the first half of the game, the Panthers entered the locker room under a 3-point deficit. In the second half, Testaverde left the field with a strained Achilles tendon, and was replaced by former Houston Texans quarterback David Carr. Ultimately, the Panthers lost 31-7. Reports said that Testaverde would be out for at least a week. On November 18, 2007, Testaverde and the Panthers played at Lambeau Field against Brett Favre and the Green Bay Packers for their Week 11 matchup. With Testaverde at 44 years of age and Favre at 38 years of age, this was the oldest starting quarterback duo in any game in NFL history. The "Senior Bowl", as it was nicknamed in the media, was won by Favre's Packers 31-17. On December 2, 2007, Testaverde became the second oldest starting quarterback in NFL history at 44 years and 19 days old. He threw two touchdown passes against the San Francisco 49ers in the Panthers' win, breaking his own record for the oldest starter to win an NFL game. During this game, Testaverde and Dante Rosario became the passer/receiver duo with the largest age gap between them (20 years, 346 days) to connect for a touchdown. Testaverde announced his plans for retirement on December 29, 2007 which would take effect after the final game of the season against the Tampa Bay Buccaneers on December 30. Panthers head coach John Fox sent him into the game to take the final kneel-down snap in a game which the Panthers won 31–23 over the Tampa Bay Buccaneers, expectantly bringing to an end to the 44-year-old's 21-year NFL career at the same city he was originally drafted. By the start of 2008, he made it official by announcing his retirement from professional football in January. He, therefore, first became eligible for induction into the Pro Football Hall of Fame in 2013. Although in many ways he had the career of a journeyman quarterback, Testaverde holds several NFL records related to his longevity in the league, including the NFL record for having thrown a touchdown pass in 21 consecutive seasons, the most losses by a starting quarterback with 123, and throwing touchdown passes to an NFL record 70 different players (broken by Tom Brady in 2018). Also, he holds the second highest completion percentage in a single game during the regular season (at least 20 attempts) at 91.3% (21/23), in 1993 against the Los Angeles Rams (Kurt Warner is the first, with 24/26 for 92.3%). In 1995, the Cleveland Browns moved to Baltimore, renaming themselves as the Baltimore Ravens. Testaverde is currently the Quarterbacks Coach at Jesuit High School of Tampa, where his son Vincent, Jr. attended. They reside in Tampa, Florida. He and his wife, Mitzi, have two daughters and a son, Vincent, Jr. As of 2017, Vincent, Jr is the starting quarterback for University of Albany. ^ Blair, Cynthia (April 24, 2004). "1981: Vinny Testaverde Graduates from Sewanhaka High School". Newsday. Archived from the original on October 1, 2007. Retrieved January 1, 2007. ^ Heisman Trophy, Winners, 1986 – 52nd Award: Vinny Testaverde Archived October 4, 2013, at the Wayback Machine. Retrieved December 28, 2011. ^ "Vinny Testaverde #14 Quarterback New England Patriots". Yahoo Sports. December 15, 2005. Retrieved January 2, 2007. ^ Arthur, Bruce (November 18, 2006). "Vinny, vidi, vici: Our game picker admits his aim is often little off, but like recently unretired Vinny Testaverde, he keeps on chuckin'". National Post. Archived from the original on September 29, 2007. Retrieved January 2, 2007. ^ "1996 Pro Bowl rosters". pro-football-reference.com. Retrieved January 2, 2007. ^ a b Transactions since 1998 : "Vinny Testaverde - Transactions". Foxsports.com. Archived from the original on September 30, 2007. Retrieved January 2, 2007. ^ "1998 Pro Bowl rosters". pro-football-reference.com. Retrieved January 2, 2007. ^ Diegnan, Mike. "MNF's Greatest Games: Miami-New York Jets 2000". ABC Sports Online. Retrieved January 2, 2007. ^ "Testaverde benched for Pennington". NFL.com wire reports. September 30, 2002. Archived from the original on December 14, 2006. Retrieved January 2, 2007. ^ Testaverde plans to play: "Testaverde plans to play". Bostonherald.com. Archived from the original on August 20, 2007. Retrieved May 29, 2007. ^ "With Carr hurting, Testaverde could see action Sunday - NFL - ESPN". Sports.espn.go.com. October 10, 2007. Retrieved September 20, 2010. ^ "Vinny Testaverde - Carolina Panthers - News - NFL - Yahoo! Sports". Sports.yahoo.com. November 13, 1963. Retrieved September 20, 2010. ^ The Associated Press (November 19, 2007). "Brett Favre leads Packers past Vinny Testaverde, Panthers". Nydailynews.com. Retrieved September 20, 2010. ^ a b "Tampa Bay Buccaneers Franchise Encyclopedia". Pro-Football-reference.com. Retrieved August 21, 2012. ^ "Baltimore Ravens Single-Season Passing Leaders". Pro Football Reference. Sports-Reference. Retrieved January 10, 2017. ^ a b "New York Jets Franchise Encyclopedia". Pro-Football-reference.com. Retrieved August 24, 2012. ^ ""2013 Jesuit Football"". Archived from the original on August 26, 2013. Retrieved June 21, 2013. ^ "Hillsborough County property records"